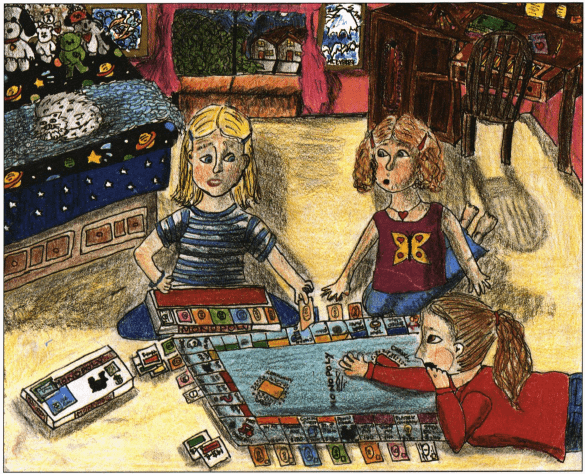 Illustrator Christy Callahan, 13, for Twisted Friendships by Hana Bieliauskas, 13. Monopoly! 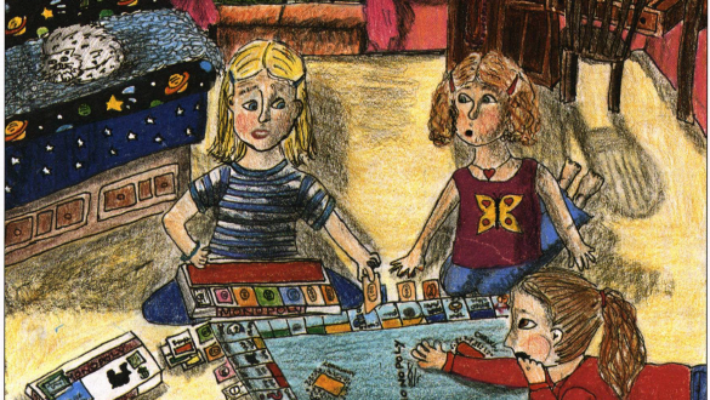 What adult doesn’t have memories of playing Monopoly with friends? Playing Monopoly with Herb Ritz, my best friend in junior high, remains one of the strongest memories from my early teens. When I was thirteen, the same age as Hanna when she created this magnificent drawing, Herb and I would sit on my bedroom floor for hours at a time playing the game. Looking at this drawing reminds me exactly where in my room we sat to play — a little to the side of an overstuffed armchair, near my dresser, with my bed behind me. My room had triangular-shaped leaded glass windows on two sides. I can vividly recall one game we played when the light coming in through the windows was particularly beautiful. It was a blue day in Los Angeles. Light filtered through the large Pittosporum tree and camellias that were outside my bedroom’s windows. Herb became a famous photographer, but unfortunately, he died young. Art is a magical thing. An evocative drawing, like Hana’s, takes you places. I hadn’t thought about those Monopoly games for a while. This picture reminds me how much I miss my friend. Over the upcoming holiday I am sure many of you will be playing board games with friends and family. 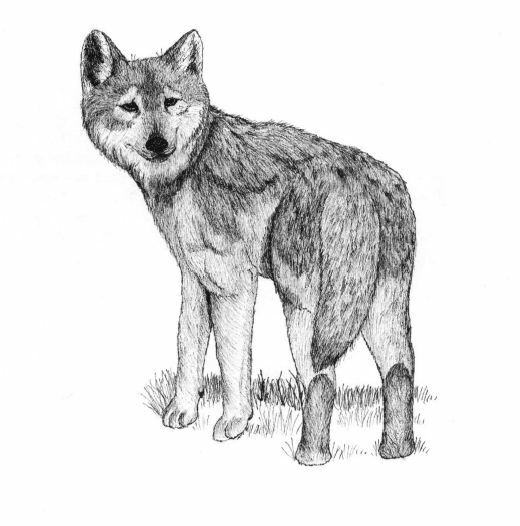 I can think of no better inspiration for drawings of your own than this one by Hana. Note the incredible detail in every part of the drawing including the shadow of the chair projected on the carpet which makes clear that sun was streaming in through the window. 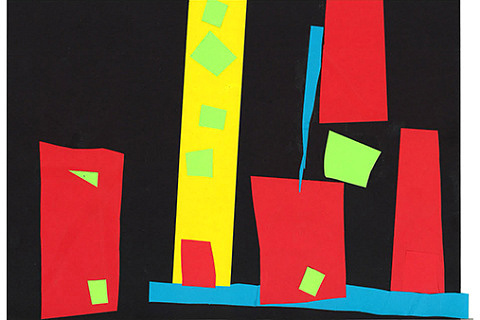 If you make a drawing you love — please send it to Emma so she can consider it for Stone Soup. New posts from our Stone Soup Bloggers have come in, and people are enjoying hearing their ideas on everything from nature to sport to sewing. Thank you, bloggers! 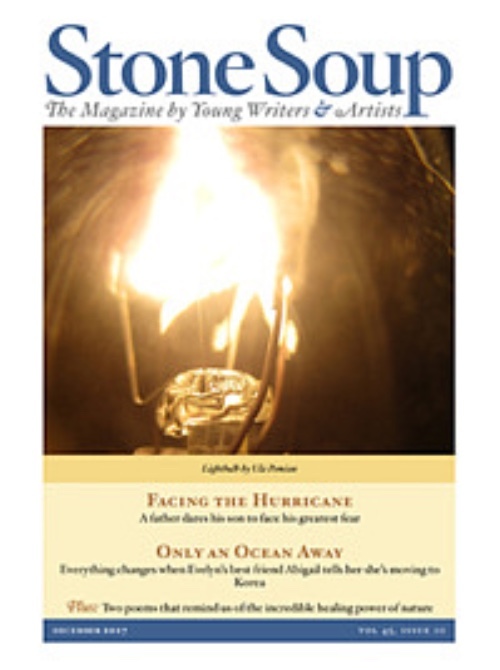 Remember, if you want to blog for Stone Soup, go the Click here to Submit button and upload a proposal. You are not limited to fiction or poetry. Blogger Jessica Crocker has posted a Christmas felt Santa project. In Jessica’s own words, “These hand sewn ornaments are easy to make and make great gifts. I cut the shapes out free-hand for mine, but there are plenty of free templates on the internet if you prefer.” I have lots of red felt on hand. 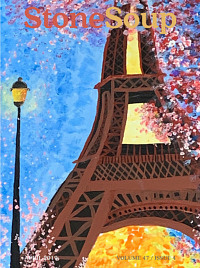 My daughter and I will be making this project to hang on our tree. Blogger Lucas Cooke has a thought-provoking essay “Books versus Video Games.” Read Lukas’ blog and join those (including me) who have already left comments to tell Lukas what you think of what he’s saying. If any of you experienced the fires up in Sonoma, Napa, and Lake Counties or are currently caught up in the fires burning from Ventura County to San Diego we hope you are all safe and well. Do please send us anything you have made (or are making) about these immense, life-changing, memory-searing events. We always want to share your photographs, drawings, stories, poems, and music, whatever they might express. The 2017 Annuals have arrived from the printer! They are 370 pages, are printed in full color, weigh over a pound, and are simply magnificent. We printed 600 copies and the pre-orders we’ve received mean they are going to disappear quickly when we start shipping on Tuesday. 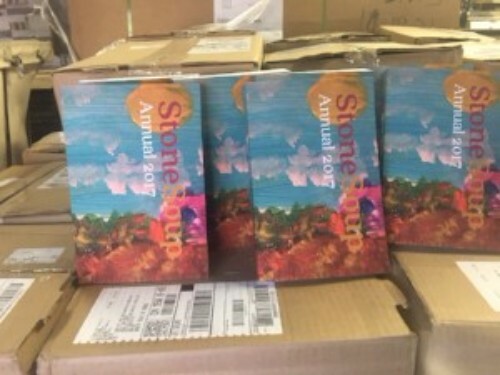 If you go to our website, stonesoup.com, and click on subscribe you (or your parents or grandparents) can order the print Annual, a digital subscription, or our best value, and I think the the best of both worlds, a digital subscription plus the print annual. You will be able to choose shipping options. 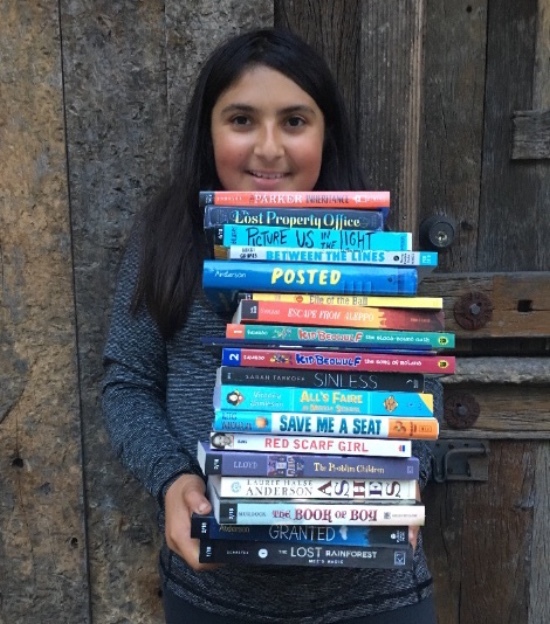 This is my daughter with the books we brought back from the St. Louis’ teacher’s convention. Thank you all of you who have told us you’d like to review books. I will start sending out review copies from this batch on Monday, and there will be more to come in the new year. We are thrilled to share the December 2017 issue – our first ever food issue! Log into your account now to read all the stories, poems and recipes published this month, and enjoy some stunning art from our contributors. Subscribers can also download a PDF copy to print at home or upload to an offline device; or download our app and sign in to read it there. If you need any help getting access to the full range of material in this month’s issue, contact our customer service center on +1 215-458-8555 or at stonesoup@icnfull.com. The lines are open 7:30 a.m. until 10:00 p.m. Monday to Friday, and email will be responded to within three days. The farm looked old and dull, but in my thoughts everything, even the quiet farm, was eerie. I had the dream again; the same dream I had every full moon, the only dream I ever had. The gentle eyes of my mother looked down at me. All I could see were the soft, green eyes. I could feel the warmth and fear of my mother, fear that was for me. “Terry!” called my father. “Breakfast!” He was actually my adoptive father. He found me in the woods and took care of me. He knew that adopting me would be a bad idea. He had no experience whatsoever with raising a child, and the only person who could help him would be his younger brother. He spent weeks searching for my family, but found no one. He could give me up to an orphanage or adopt me himself. I suppose he felt responsible for me, or maybe it was sheer pity, but he took me in and I was brought up living on a farm with him and my uncle, Dude. He is really my Uncle Ben, but “Uncle Ben” makes rice, and Dude was a childhood nickname. I suppose I liked Dude all right, but he was gone so much that I didn’t really get to spend much time with him.